As of January 2019 it's undergoing shopfitting work to convert it to a marketing suite for Croydon Council's housebuilding company Brick By Brick. It was previously occupied by a travel agent called Wallace Arnold Worldchoice photo, but this moved across the road to Woolwich House (third floor, 43 George Street) in December 2017 photo of sign. The premises were still vacant as of February 2018, June 2018, October 2018, and December 2018. 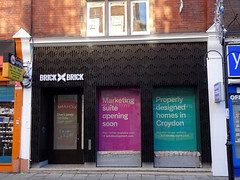 By January 2019, shopfitting work had begun to convert it to a marketing suite for Croydon Council's housebuilding company Brick By Brick photo. Last edited 2019-01-22 18:13:47 (version 29; diff). List all versions. Page last edited 2019-01-22 18:13:47 (version 29).